Director Christopher Martin [Review (1969), The War on Democracy (2007) and Under the Wire (2018)] opens the film with footage of Conroy at one of his darkest moments in Baba Amr, a city-district in southwest Homs in central Syria. Much of the opening sequence has the feel of an expose’. However, that soon gives way to a non-linear narrative that juxtaposes, at first Conroy, and later fellow journalists, recollections of those two and a half weeks they spent together attempting to tell the world what was happening to the women and children in Baba Amr. At the center of the story is their martyr, Marie Colvin, an American war correspondent, regarded as one of, if not the finest, combat journalist of her generation. Colvin came to fame through her reporting in East Timor in 1999. Without Marie’s reporting the UN said the people of East Timor would have perished. In 2012, despite the exodus of virtually every Western journalist, Colvin, felt compelled to tell the world what was really happening in Syrian towns, especially the 28,000 civilians who were in Baba Amr. So much so, Colvin risked her life until finally paying the ultimate price when a precision bombing attack successfully neutralized its target, what was known in Baba Amr as the media center which in reality was a concrete “shithole” room on the 6th floor of an evacuated building. Meanwhile, the United Nations and the world looked on helplessly as the Assad regime continued its daily bombing assault beginning first at 7:00 A.M. and later moved up to 6:30 A.M. According to French journalist, Edith Bouvier, who suffered a serious and potentially life-threatening leg injury when the targeted bomb hit the “media center,” – as many as fifteen shells would hit in the area in the first thirty seconds of the precision bombing. Eventually, the wounded, surviving journalists would make a last-minute escape. Having been told a Red Cross ambulance would be coming to take her and her co-journalists to safety during the first-ever cease fire, the journalists were warned by a man from the Red Crescent not to get in the vans waiting outside. Following his heeding the group refused to leave. Soon after, a group of rebels shepherded the correspondents to safety only asking that the journalist tell the world what was really happening in Baba Amr. Under the Wire is a story of international fear and apathetic response from the global community. Despite numerous videos surfacing from Colvin and what many describe as a miracle worker, Dr, Mohammad Mohammad, pleading for the international community to halt the slaughter of innocent civilians whose only crime was a want for a more democratic way of life, nothing happened. Conroy’s life was saved. His mission has been to tell the world what happened in Syria. Utilizing archival news reports from the BBC and CNN (with Anderson Cooper), personal footage and photos from his times with Colvin, Conroy has set out to tell the world what happened. Under the Wire is the story of Marie Colvin’s passionate commitment to tell the world of the women and children in Baba Amr, and their shared experience of the “widow’s basement,” an underground shelter for women and children crammed with thin mattresses, little food and without basic medical assistance. This is not an easy film to watch. Booming sound, partial profile shots, raw, fuzzy footage, along with some shaky, point-of-view, hand-held shots create tension and unease. Nevertheless, this is a story that needed to be told and now it needs an audience. The world needs to know the truth. Highly recommended. Reading this film review Under the Wire, by Larry Gleeson about war in Syria, reading about war and the military attacks was interesting to read. How women and their children suffering from being assaulted. The suffering women and children were kept a secret. Combating all this terrorism and attacks like Larry goes into depth about his review was a very traumatic experience not just for the children who were enduring pain but for the mothers as well because what mother likes to see their child. How government does nothing to improve this, there was a lot of ear as we read in this review. There was a lot of war injuries, since there was a lot of attacks. This film was very hard to watch before there was a lot of blood and thins going on it was hard to watch because it made you really see how war is; not to mention just specifically in syria but anywhere where there is war. To see war is not a good thing, some of us the viewers do not really take war into consideration because maybe the fear that we would be able to handle it, but the sad truth is that it is happening and the viewers do not want to see that reality that all of this is a serious matter. This was a wonderful review that Larry did. 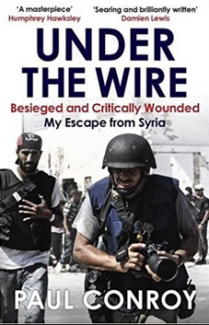 Reading the review of the film Under the Wire, by Larry Gleeson I really learned a lot about the war going on in Syria and what’s being done to lots of family and children and women. What I took from this review was what’s going on and happening to the women and children of that third world country and the damaging and deadly consequences are going on because of the war, and the innocent lives that are being lost. Larry really goes in depth to tell his readers about the traumatizing acts of terrorism and the assaults the women and woman and children are suffering from. Watching the trailer, it was somewhat hard to watch due to the amounts of blood, and death going on that makes us see what the destruction of war leaves behind. This review also showed the commitment that the team went to great lengths to share the stories of the women and to shed light on the slaughtering of the innocent in the path of the destruction of hatred. This film review of Under the Wire, by Larry Gleeson is well articulated as it explais the war in Syria. It does a good job of explaining the both the military attacks that occurred and the suffering assaulted women and babies endured, though this suffering was kept a secret. Larry goes into depth of how the traumatic experiences for the children and mothers affected their lives. He exaplains that the government is very hands off and does not attempt to control nor improve things. Because of the nature of war and its grusome images, this move is hard to watch. Upon reading this review it is evident that viewers do hardely take war into consideration during our daily life because it seems like some thing that is happening far away. Only when it is in our own backyard does society come to the realization that war is bad. This review was thought provoking and a job well done. I honestly did not think this film review for Under the Wire was too riveting. I feel it could’ve been shortened heavily, and would be better for it. It seems some elements of the film are repeated multiple times, making it hard to not get bored while reading. It was however very detailed on describing the major points of the film and why all viewers must be educated on it. I don’t think I would be personally interested on watching this film based on its review. Hi Larry Gleeson! You made an excellent post that really portrayed a great viewpoint on the film Under the Wire. I have never watched this movie before, but after reading your review on the film, I am eager to watch it. I really enjoyed how you analyzed the terrible experiences that many of these women and children go through. He did a great job in describing that the government had a very “hands off” mindset. This review really showed how invested the filming team truly was in making sure that they got the full picture. I can’t wait to watch this film and be able to see all these analytical views for my self. Your review of this film was very informative, it made me intrigued with this film. Although, I have never seen this film I have heard about it and you describing it as passionate madam want to watch it even more. Your end paragraph was what caught my eye. When you stated that this story needs to be told, that was a very good way to drag in the reader. I got a great idea of what the film is going to be about, and your idea and opinions on it. Overall, your response was great and your views really helped me form an idea about this movie. Your review helps me to form a picture of Under the Wire. It is very specific and informative, but a little bit repetitive. From your review, I know that it talks about how women children live in third world countries while there are wars destroying their homes. This film emphasizes the disaster the wars bring to the people. It forces people to see what they don’t want to see. Most people have never been in a war, so we might don’t even care about the government’s choice of involve in a war, but after seeing people losing their family, we know who miserable it is. Larry does a good job of pointing out the points that this film wants to make a difference. The film review “Under the Wire,” by Larry Gleeson about war in Syria. This film review tells a lot about the details of the story in this movie. From the film review, I almost learned about the film’s occurrence, passing and ending. Two war-correspondent Marie Colvin and photographer Paul Conroy entered war-ravaged Syria to cover the plight of civilians trapped in besieged Homs, under attack by the Syrian army. Only one of them returned.From the story, analyze the value of the film, the impact on the society and the people watching. The author also expressed his self-consideration of the film and the knowledge gained from the film. I found your review to be well articulated and profound is some senses. The film itself, which unfortunately I have not had the chance to see at this time, seems like a very touching piece. War seems like a quite commonplace theme and location in films, thus it is impressive that directors continue finding unique takes and such. Nevertheless, I will keep this review in mind when I do get around to viewing this intriguing movie. I agree that the truths of the inhumanity of war must be spread, and film is a fantastic and brave venue to do such. I additionally appreciate your warning at the conclusion of your review. In brief, great review, can’t wait to see the film. From your review about the film “Under the Wire”, I get the information about the main idea and story of the plot. In the first paragraph, you present the background and the beginning of the plot as a hook to draw my attention and interest to the details of the film. Then you analyze the film through the footage, narrative structure, lighting technique, and kinesis scenes. According to your review, the film is shot by the chronological order. The plot has a 3-act-structure. The film first set the main characters and the issue between government and citizens up. Then the film presents the conflict between the Assad regime and journalists and also citizens (the climax of the film). Finally, the film going to end with the journalists’ escape. Furthermore, you not only provide the analysis but also the influence(source) of the film to the real world. I would like to watch the film if I have a chance to after watching your excellent review. This film review of Under the Wire provides background about war in Syria. I found the Syrian military attacks to be particular interesting. The review highlights the military fighting terrorist attacks and it goes into depth about detrimental experiences for the children involved and also for the mothers. You also bring up the point that government doesn’t help to make anything better. The review provides background information throughout the first paragraph and readers understand that war is not a good thing, which is not entirely understood. You effectively analyze the film’s narrative structure and mise-en-scene. The review outlines 3-act-structure. Overall, very good analysis! This review of Under the Wire completely opened my eyes to the dangers of war and your review also showed the highlights of what a director and actor can do to convey a story like this accurately and effectively. I appreciated the vocabulary you used and I also enjoyed the points you brought up about the acting and the overall organization of the film. I have decided I am really interested in seeing this movie due to how exciting and real you made it sound along with the fact that I enjoy war movies.Thank you for the great review!